Governor Charlie Baker’s plan to curb the state’s rising health care costs was rejected by lawmakers again Wednesday. 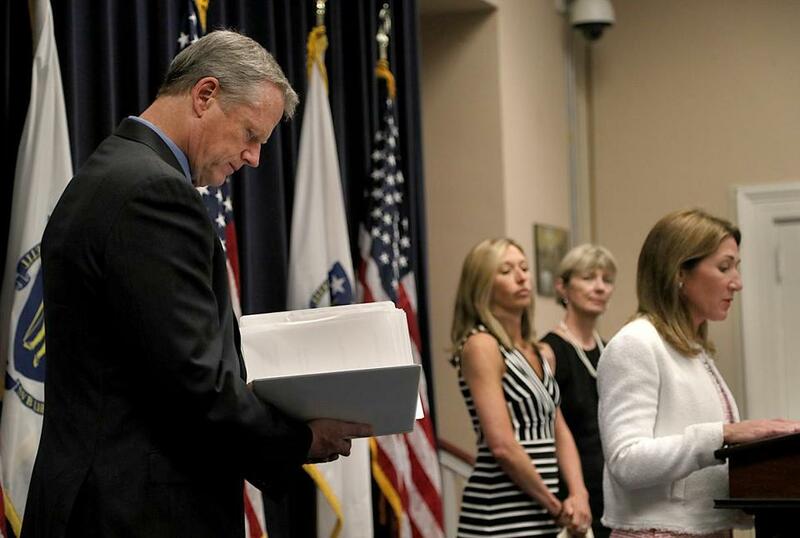 Massachusetts legislators, in a showdown with Governor Charlie Baker, again rebuffed his plan to curb the state’s rising health care costs, in part by moving some poor adults off of the state’s health care safety net program. The Democrat-controlled House and Senate on Wednesday approved a related Baker proposal to raise $200 million a year for the state’s Medicaid program through new fees on employers and use it to help fund health costs. But they rejected a complementary set of proposals to curb spending, which Baker wanted lawmakers to approve as a package. The governor could accept or veto their decision. It was not immediately clear how he would respond. Democrats in the Legislature have enough votes to override his veto. The policy dispute between the governor and lawmakers, who generally get along, highlights the immense challenge of helping the poor while keeping public spending in check. It also puts Baker in a difficult spot with the business community, which supports paying new fees only if the state also implements the governor’s cost-cutting plan. Business groups said Wednesday that they would urge Baker to use the veto. Baker presented his health care proposals in late June, when members of the House and Senate were already in the final stages of drafting state budget legislation. Lawmakers didn’t include Baker’s proposals in their budget, saying they didn’t have enough time to fully consider the complex set of ideas, which would affect hundreds of thousands of people. Last week, Baker again urged lawmakers to approve his plan. But, in one of the biggest clashes yet between the Republican governor and Democratic Legislature, lawmakers rejected Baker a second time. Baker administration officials had presented their health care plan as a common-sense approach to reining in the costs of the state Medicaid program, or MassHealth, which covers 1.9 million people. Perhaps their most significant proposal would move 140,000 adults, including 100,000 parents, from MassHealth onto subsidized health plans on the state Health Connector. These adults would not have to pay premiums, but they would be hit with higher out-of-pocket costs — on average, about 3 percent of their income. They also would have to pay extra for dental benefits, unless they sought dental care at community health centers. The change would apply to adults just over the poverty line, earning between $16,240 and $21,600 a year for a household of two. Additionally, Baker proposed barring many low-income adults from obtaining MassHealth if they have access to affordable coverage from their employers. Administration officials have warned that without these changes to MassHealth, they might be forced to make cuts to state spending, on top of what some lawmakers have described as the most painful funding levels in years. But legislators, at least for now, are siding with health care advocates who argued that the governor’s plan would hurt poor families who can’t afford even modest hikes in what they pay for health care. “There is considerable uncertainty around the effects this plan will have on low-income individuals, the elderly, and the disabled,” State Representative Jeffrey Sánchez, a Boston Democrat, said on the House floor Wednesday. “There is no easy solution to tackle rising health care costs,” added Sánchez, the House budget chief. Brian Rosman, policy director at Health Care For All, said he was glad lawmakers heard advocates’ concerns. “We’re really pleased that they rejected the governor’s Medicaid cuts, which would really have been detrimental to people who depend on Medicaid,” he said. Medicaid, or MassHealth, accounts for about $16 billion in public spending in Massachusetts, which is split between the state and federal governments. Sánchez said the health care debate isn’t over and indicated that legislators may continue to deliberate Baker’s ideas for changing MassHealth at some point in the future. Senate leaders have said that they are also working on legislation to tackle health care costs. Wednesday’s vote came one day after a lengthy State House hearing on the governor’s proposals. At the hearing, Democratic legislators were skeptical of the proposals and questioned the wisdom of making big changes to MassHealth at a time when Republicans in Congress are trying to repeal and replace the national Affordable Care Act. The plan approved by state legislators Wednesday would slow the rate of growth for unemployment insurance rates that employers pay to the state, in exchange for charging employers higher fees on health care. But business leaders said that is not enough. They said the state must get serious about containing MassHealth, or it will continue to squeeze out other important budget priorities.